Interest Rates for a 30-year fixed rate mortgage have dropped to 4.41% from near 5% in 2018. Take advantage of more inventory coming to market in the spring to find your dream home! Buying now will allow you to start earning equity today! If you're looking to buy, sell, or invest in the Phoenix or surrounding area, CALL The Regal Team Today. Bottom Line: Any blip in income, assets, or credit should be reviewed and executed in a way that ensures your home loan can still be approved. The best advice is to fully disclose and discuss your plans with your loan officer before you do anything financial in nature. They are there to guide you through the process. In the majority of the country, this weekend marks the start of Daylight Savings Time as we set our clocks forward an hour on Sunday at 2:00 AM EST. 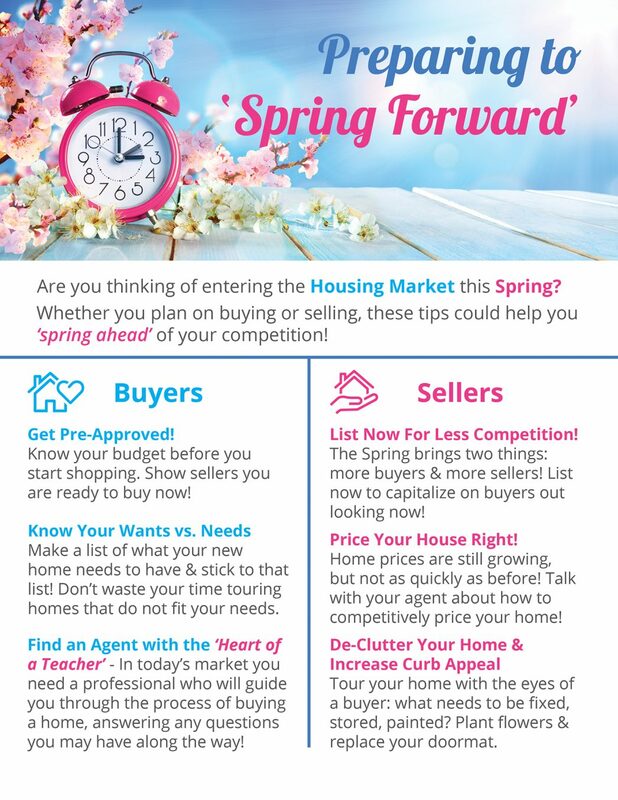 Whether you plan on buying or selling this spring, these tips could help you ‘spring ahead’ of your competition! Spring brings two things: more buyers & more sellers! Get prepared now to stand out in the crowd! Glendale, Arizona is the latest Valley of the Sun community to ban the use of cellphones while driving. Last week, the city of Glendale Council voted unanimously to enact the new law. This coming directly after the tragic loss of the Salt River tribal police officer, who was struck and killed by a distracted driver on the 101 Loop near Scottsdale. The Glendale ordinance prohibits talking on cellphones, sending text messages or otherwise using a handheld device while operating a motor vehicle, unless the device is in a hands-free mode. There will be an education and warning period for the next six months before the city of Glendale Police Department begin strict enforcement. First time offenders are looking at a $250 fine and it is considered a primary offense, meaning that an officer can pull you over for using a handheld device. What are the rules in other Valley of the Sun cities? Looking to sell or buy a home in the Glendale or the surrounding area? Contact us today! The Regal Team has in-depth knowledge of the market and can provide you with the information you need on purchasing, selling, investing, financing and owning real estate in the Valley of the Sun! Has the wintertime got you feeling blue about the look of your home? Check out these 5 fab home upgrades for under $100 to spice up your space! 1.) Paint Your Door: Painting the front door gives the front of your house a fresh, new look in an afternoon. Materials, including painter’s tape, paint brushes, primer and paint, should run well under $100. Just make sure the color you pick is approved by your HOA if you have one in your community. 2.) Invest in a Pressure Washer: With a pressure washer, you can strip the dust, dirt and grime off your home and pathways from the wear and tear of winter weather. It’s a great way to make your home look new again, especially the windows. Not interested in buying a pressure washer? Consider renting one from your local hardware store. 3.) Update Your Light Fixtures: If the light fixtures that came with your home look like something from the early 90’s era, consider updated them for a fresh look that’s guaranteed to brighten your home. Keep an eye out for less costly pendant lights and lanterns to hang over a kitchen table or spruce up a hallway. 4.) Add a firepit: Whether you want to warm up around the fire and chat with friends or recreate the camp experience by making smores with your family, adding a firepit to your backyard is a great upgrade that will provide a great resource for entertaining. You can make a fire pit in your backyard with simple pavers or bricks or buy a tasteful one from Amazon to compliment your poolside patio. Depending on the style, a firepit can make a really nice focal point for your backyard. 5.) Dress Up Your Furniture: Buying a whole new sofa set will run you well over a $100. But you can always give your old couches new life by pulling a slipcover over it. These days, it’s easy to find an inexpensive and fashionable slipcover. You might even have enough change left over to buy some fun new accent pillows. Want more home update ideas? Looking to sell or buy a home in the Phoenix area? Contact us today! The Regal Team has in-depth knowledge of the market and can provide you with the information you need on purchasing, selling, investing, financing and owning real estate in the Valley of the Sun! Thinking of Selling Your Home This Spring? Are you thinking of selling your home this spring? Here are a few tips to help you create a smooth selling experience. De-clutter: de-cluttering helps prepare your home for the big move, plus there is truth in the say “less is more.” Go one room at a time, and divide belongings into categories: keep, yard sale, donate or trash. Start Packing: start packing now. Box up all your seasonal clothing to make your closets look roomier. In addition, a buyer will appreciate a “neutral” vibe in your home by packing away your personal or sentimental valuable. Repair and improve: Your home’s curb appeal is very important! Think about painting the front door and replacing the hardware. Do you have out dated or damaged light fixtures or appliances? Now would be the time to watch for sales on these items. Don’t forget to clean the windows and screens. A professional real estate agent can help you to determine which updates and/or repairs would make the most sense for your home. Establish your time frame: do you need to be moved and settled before the next school year begins? Or maybe a new job in another state is requiring your relocation. Establishing a realistic time frame is key in creating a smooth transition from one home to the next. Know the facts and trends of the market: every year we see trends and market changes and 2019 will be know different. And not all the news or hype on T.V. is accurate. Before you panic and call OfferPad, OpenDoor or request a Zillow instant offer, please reach out to a professional real estate agent to find out what your home is worth. Those convenient-buying services come with a steep price, which comes out of your hard-earned equity! The spring weather is right around the corner, making it an excellent time to list and sell your home in the Valley of the Sun. Please give us a call today to help you successfully navigate the process, while netting you the best price and in the shortest amount of time. December’s declining home sales and growing inventory solidified 2018 as the year the red-hot seller’s market moved toward a balanced market. Price growth also moderated, though December was the 33rd consecutive month of year-over-year increases in home prices, according to the RE/MAX National Housing Report, which includes fifty-three metro areas. December’s year-over-year decline in home sales of 12.1 percent set a December record in the 10-year history of the report and also marked the fifth consecutive month that home sales were lower than 2017. December was 2018’s 10th month of year-over-year declines in home sales with only April and July topping 2017 sales. Most telling was December’s 4.6 percent growth in inventory, which was also a report record. December’s year-over-year inventory increase marked the third consecutive month of growth – a trend reversing a decade-long streak of year-over-year inventory declines. While fifty-four Days on Market was a record low for December sold listings, the 4.1 Months Supply of Inventory was higher than December 2017’s 3.7 months and ahead of November 2018’s 3.9 months supply. Home buyers paid record amounts throughout 2018 as prices grew year-over-year in every month last year, led by June’s Median Sold Price of $258,500 – an all-time report high. Even so, December’s year-over-year increase of 2.1% was 2018’s smallest, and far lower than the 8.1 percent price growth from December 2016 to December 2017. Of the fifty-three metro areas surveyed in December 2018, the overall average number of home sales is down -8.5 percent compared to November 2018, and down -12.1 percent compared to December 2017. None of the fifty-three metro areas experienced an increase in sales year-over-year. In December 2018, the median of all fifty-three metro Median Sales Prices was $240,000, up 2.1 percent from November 2018, and up +2.1 percent from December 2017. The average Days on Market for homes sold in December 2018 was fifty-four, up three days from the average in November 2018, and down three days from the December 2017 average. Click here to download your copy of the RE/MAX National Housing Report for December 2018. . Looking to sell your Phoenix home or buy a home in Phoenix? Contact the Regal Team today! We offer unparalleled service to all clients in the Phoenix, Arizona real estate market. Your complete satisfaction with our service and representation is our number one priority! We have so many wonderful clients, friends and families to thank for helping us make 2018 an outstanding year! We are beyond blessed to have served the real estate community with such success and could not have done it without each of you. We look forward to another amazing year in the upcoming 2019 selling season. Thank you again! Natural disasters struck the United States with a vengeance in 2018, as floods, wildfires, and hurricanes damaged thousands of homes and businesses. Eleven events in 2018—the third year in a row with an above-average number of catastrophes—led to $11 billion or more in residential and commercial losses, according to the newly released Natural Hazard Report from CoreLogic. In 2018, there were more than 1,600 significant flood events in the U.S. Residential and commercial flood damage in North Carolina, South Carolina, and Virginia from Hurricane Florence caused up to $28.5 billion in damages. Eighty-five percent of the residential flooding losses were not covered by insurance, the report showed. Texas, Maryland, and Wisconsin also saw 1,000-year floods last year, with some in areas that had experienced 1,000-year floods less than two years before. Nationwide, 6 percent of properties are within the Special Flood Hazard Areas. But only about one-third of those properties have flood insurance policies. In 2018, the Atlantic hurricane season had 15 named storms, including eight that became hurricanes. Hurricane Florence (Category 1) and Michael (Category 4) caused massive damage when they struck the U.S. About 700,000 residential and commercial properties saw catastrophic flooding and wind damage from Hurricane Florence. Michael struck the Florida Panhandle and caused up to $4 billion in residential and commercial insured losses from the wind and storm surge, according to CoreLogic’s report. Unprecedented wildfires also wiped out real estate in 2018. “The number of acres that burned in 2018 is the eighth highest in U.S. history,” as reported through Nov. 30, 2018, according to CoreLogic. Eleven western states saw at least one wildfire that burned more than 50,000 acres. California and Oregon saw the most. Northern California’s Camp Fire in November 2018 turned nearly the entire city of Paradise into ash. More than 18,000 homes and businesses were damaged. The Woolsey wildfire in Malibu destroyed more than 1,600 structures. These two wildfires alone caused up to $19 billion in total insured and uninsured losses, CoreLogic estimates. Living Coral: Paint company Pantone announced “Living Coral” as its 2019 Color of the Year. The orange shade with golden undertones embodies “warmth and comfort,” Pantone says. “Living Coral easily delivers a graphic pop to a space,” says Rebecca Snowden, an interior style adviser at Furniture Choice. “Introducing it through small elements will brighten up a room, creating a sense of coziness that’s also fresh and chic.” For example, the energetic tone can liven up cushions, throws, and rugs in a living room. In a dining area, color blocked plates and coasters in the peachy hue may add some spark to a table arrangement, she says. Read Furniture Choice’s guide to weaving in more Living Coral into your home design. Blueprint: Behr has gone blue with its top color choice for the new year. Blueprint is a mid-tone blue that is described as warmer than denim but softer than navy. Behr is embracing a full range of blue, teal, and grays as key color choices in 2019. “Layer light and dark blues on walls, cabinets, furniture, and decor for impactful results,” Behr says. Cavern Clay: Sherwin-Williams has picked a warm terra-cotta color called Cavern Clay as its 2019 Color of the Year. The color embodies an American Southwest, modern desert aesthetic. “This warm, earthy hue is both casual and refined,” Sherwin-Williams says. “It can be the backdrop of a playful, welcoming dining room or kitchen when paired with bright tiles, warm stone, and sculptural greenery.” It also compliments materials like leather and woodgrains.